I Buy Way Too Many Records Dot Com: Unwound - Kandy Korn Rituals 7"
This week's Unwound Wednesday is the Kandy Korn Rituals 7". While I can say for sure that I do not like candy corn, my thoughts on this 7" are a little bit mixed. The first two songs, "Kandy Korn Rituals" and "Against" are really loud and screamy. While I give Unwound more slack than I would most bands about that sort of thing, these particular songs end up seeming kind of one dimensional. 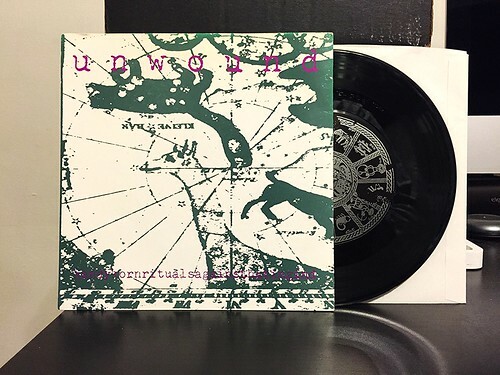 What I always liked about Unwound was their ability to sharply cut from slow and brooding to loud and full of rage at the drop of a hat. Both of these are pretty much non stop chaos aside from some feedback between the two songs. The third song, "Hating In D" is much more in line with the Unwound that really gets me. The chorus is an explosion of energy, but the verse is much more laid back and is driven by the bass guitar. The problem with this song is that it was recorded live, so you lose some fidelity there. The more I'm revisiting these old 7"s the more obvious it is how much Unwound evolved over the course of their time together. But as my goal is to have a complete 7" collection of theirs, I'm going to end up with some crazy loud early singles, that's for sure.